Diabetic neuropathy is a common complication of diabetes. Clinical levels of neuropathy range from roughly 7% of those with diabetes in their first year to 50% of those who have had diabetes for over 25 years. (1) If you include patients with subclinical levels of neuropathy, the incidence may exceed 90%. While the nerve damage caused by this disease cannot be reversed, there are numerous things that you can do to slow the progression of the disease and reduce, or even reverse, the symptoms, helping you to regain your quality of life. 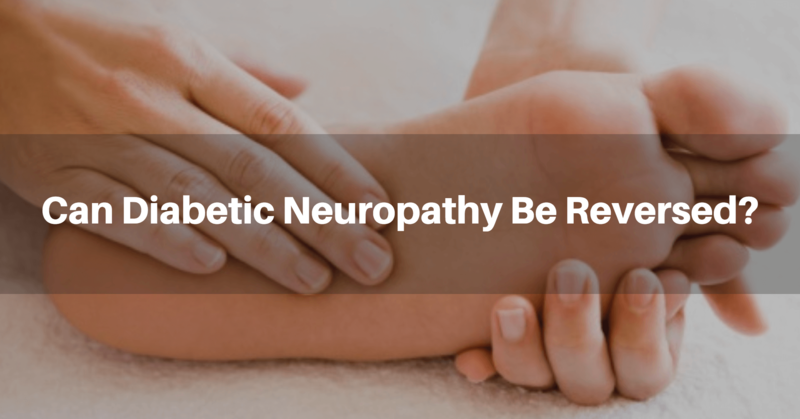 Diabetic neuropathy is a complication of both type 1 and type 2 diabetes that is caused by damage to cells in the nervous system, known as neurons. (2) The incidence is higher in those with type 2 diabetes, largely due to the earlier detection and disease progression of type 1 versus type 2 diabetes. Additionally, the risk of diabetic neuropathy increases the longer that you have diabetes. Initial symptoms tend to be minor, so you may not notice that you are experiencing symptoms until damage has occurred that disrupts the quality of your life. Early symptoms of this common condition can include tingling, numbness, pain, burning, or weakness in your arms, hands, legs, and feet. If you experience any of these symptoms, see your doctor right away so that you can start taking the steps needed to regain your health and avoid more severe complications. Symptoms and complications range depending on the type of neuropathy that you have. (1) Diabetic neuropathy is characterized as either focal (affecting one specific nerve) or diffuse (also known as polyneuropathy, meaning that is affects many nerves) damage to your autonomic or peripheral somatic nerve fibers. Peripheral neuropathy, also known as distal polyneuropathy or peripheral diabetic nerve pain, is the most common type of diabetic neuropathy. It is characterized by damage to the nerves in your legs, feet, hands, and arms. This type of neuropathy tends to worsen over time, particularly if actions are not taken to slow its progression. Proximal neuropathy, also known as diabetic amyotrophy, is associated with muscle weakness in your legs, glutes, and hips. It may cause shooting pain that is commonly referred to as sciatica. This type of neuropathy is the second most common. It happens most frequently in elderly patients, and tends to go away with treatment and time. Autonomic neuropathy impacts your autonomic nervous system, which is also known as your autonomic nervous system. This system is responsible for critical bodily functions that you do not have conscious control over, such as your digestion, heartbeat, and breathing. 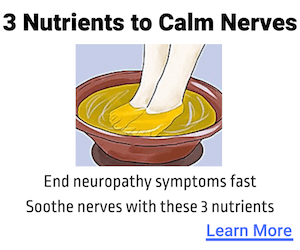 The severity and symptoms of this form of neuropathy depends on which nerves are damaged. Some common symptoms include difficulties swallowing and digestive troubles, such as constipation, nausea, and diarrhea. Focal neuropathy, also known as mononeuropathy, is the only type of neuropathy that affects just one nerve. This type of neuropathy tends to impact the head and the eyes, but it can also impact other parts of the body. It comes on quickly and causes pain in just one location. While there is no cure for diabetic neuropathy, studies suggest that lifestyle changes and certain medications may lead to a slow in disease progression. (4) There is no time that is too early to begin these lifestyle changes - nerve damage can begin even before diabetes is diagnosed, including in those that have prediabetes. Despite this disease being irreversible, there are measures that you can take to manage the pain and slow the progression to the point that you may find symptomatic relief and not need to take medications. Nerve damage caused by diabetic neuropathy cannot be reversed. Due to this inability to reverse damage, it is important to take action and come up with a plan to manage this condition early. Can Nerves Regenerate from Neuropathy? There is good news: nerves can regenerate from neuropathy. (5,6) This regeneration of nerves has been associated with improved symptoms and quality of life. There are certain foods that you can eat and lifestyle changes that you can make to help expedite this process. While there are pain medication drugs that you can take for pain relief, these treat the symptoms, not the cause. In order to find lasting relief, there are many natural lifestyle changes and holistic methods that you can employ to slow the progression and fight the causes of neuropathic pain. This study suggests that both aerobic exercises, such as jogging, biking, swimming, or tennis, and resistance exercises, such as weight training, resistance band workouts, or rock climbing, can help to treat those suffering from this condition. The Standard American Diet (SAD for short) is packed full of meat, dairy, and processed, fried, and sugary foods, particularly soft drinks, prepackaged food, and fast food. These foods are largely void of nutrients such as vitamins, minerals, and antioxidants, and full of unhealthy fats and chemicals that can contribute to the pathogenesis of diabetes, obesity, and other factors that contribute to diabetic neuropathy. Studies have found that diets with fewer of these foods and more plant-based foods can help to control the risk factors involved with the progression of this disease. (8) In fact, in comparison to the conventional Western diet, low-fat plant-based diets tend to lead to improved blood glucose levels, cholesterol, triglyceride levels, blood pressure, and obesity. Even if you are not ready to give up meat, dairy, and processed foods for good, it may be helpful to increase your intake of plant foods and decrease your intake of animal foods, processed foods, sugary drinks, and fast food. As high blood sugar levels are one of the contributing factors to the nerve damage associated with the progression of diabetic neuropathy, it is important to do what you can to keep your glucose levels in check. Use a blood glucose meter to check these numbers and record them so that you can share the data with your doctor and monitor how your numbers are changing over time. If you find that your numbers are too high or too low for multiple days in a row, contact your doctor to learn what this means and to come up with a plan to get your blood sugar levels back under control. Numerous studies have found that smoking increases the risk of developing neuropathy in those with diabetes. (9) If you have been diagnosed with prediabetes, diabetes, or diabetic neuropathy, it is important that you stop smoking if you want to avoid future complications and increased pain. There are supplements, creams, and treatments that may help to relieve symptoms with low risk of side effects. The first one of these is the supplement alpha-lipoic acid (ALA). (10) Research suggests that ALA may help to relieve pain and improve numerous clinical measures, including numbness, muscle strength, and sensory deficits. The next one is capsaicin cream, which has been shown to help reduce pain when applied to the skin over areas where sensitivity and pain occur. (11) Capsaicinoids are the compounds responsible for the spiciness of chilies. There are other alternative treatments, such as acupuncture and transcutaneous electrical nerve stimulation (TENS) that may provide relief with very low risk of side effects. The scientific support for TENS is inconclusive, largely due to the quality of studies that have been conducted on it thus far. (13) It is meant to help prevent pain signals from reaching the brain. While there needs to be more research done, it is well tolerated and some patients who suffer from diabetic neuropathy report finding relief. Diabetic neuropathy is a common condition whose symptoms may be reversed with lifestyle changes. These changes can help to slow to progression of the disease, and improve overall quality of life. Of these, exercise, eating more plant foods, stopping smoking, and monitoring your blood sugar are some of the most important changes that you can make. It is also recommended to regularly check in with your doctor to track your progression and see if there are any necessary changes in your treatment plan.